GM China is seeking a bit of added publicity for the launch of the new 2011 Chevrolet Aveo sedan. Known as the Sonic in the U.S. (they retained the old Aveo name for China), the new sedan is no doubt much improved over its predecessor in every way. The all-new design has a more aggressive stance and GM is predicting strong global sales numbers. For the launch party in China, Chevrolet brought in Transformers 3 star Rosie Huntington-Whiteley (who replaced Megan Fox for the new film). The Aveo/Sonic is larger than the Chevrolet Spark subcompact, initial sales of which have so far been disappointing in China. 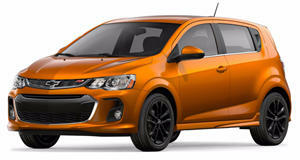 Main competition for the Aveo/Sonic will be the also new Ford Fiesta, Mazda2, and the Honda Fit.